The Minister of Finance, Mr. Ravi Karunanayake, called on Swiss investors to invest in the future investment destination that is Sri Lanka. He said that since the change of the new government in January 2015, there is a strong national oriented government in place ushering in sustainable political stability for Sri Lanka. Now that the process of political stabilization has taken place, the government is laying emphasis on the economic stabilization of the country. 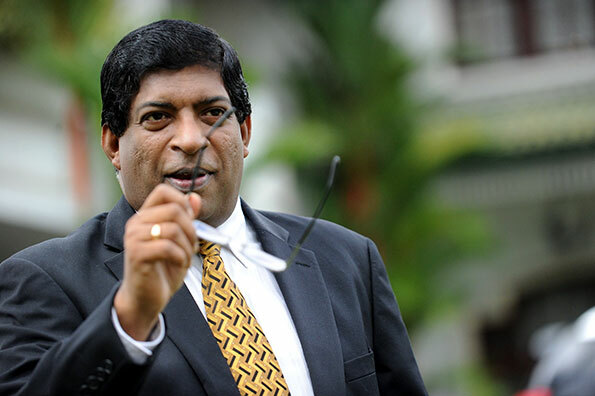 He stated that they have de-politicized the running of the administration through independent commissions appointed to look after the financial system, law and order, human rights etc.Finance Minister Ravi karunanayake extended this invitation addressing the first ever capital market investor forum held in Switzerland on 28th October 2015. This forum organized by Colombo Stock Exchange (CSE) in association with the Swiss Asian Chamber of Commerce (SACC), titled “Invest Sri Lanka“ attracted a full house for the Breakfast Meeting at The Widder Hotel in Zurich. The event saw the participation of major institutional investors surpassing the initial expectations of attendance and the interest in Sri Lanka was evident from the lively interaction, the participants had with the Sri Lankan delegation at the Question and Answer (Q&A) session, with topics ranging from opportunities in the stock market, foreign investor participation in future infrastructure developments, the ease of investing in the Sri Lankan stock market and the future economic potential of Sri Lanka. The Minister invited the participants to visit Sri Lanka and see for themselves the positive reforms that are taking place in Sri Lanka. He assured the investors that investing in Sri Lanka would bring them better returns than investing in traditional European markets. His Excellency, Mr. Ravinatha Aryasinha, Ambassador/Permanent Representative to the UN in Geneva in welcoming the participants stated that Sri Lanka and Switzerland have enjoyed a long relationship between the two countries and recalled that economic ties between the two countries go as far back as 19th Century. institutional investors. Mr. Kulatilaka also spoke about the future developments of the capital market in relation to strengthening and improving the regulatory framework,addressing risk management, diversification of product range, governance, improvement of market infrastructure and institutional building.Mr. Chanakya Dissanayake, Country Head, Copal Amba in his presentation emphasized that the Sri Lankan stock market carries attractive valuations versus its peers specially in the context of Sri Lanka`s growth profile and stated that 2015 political reset augurs well for a robust investment climate in 2016.Mr. Vajira Wijegunawardane, Director General of the Securities and Exchange Commission of Sri Lanka, outlined the measures that the SEC was taking to strengthen the regulatory framework of the capital market with the objective of creating an enabling environment for issuers to raise funds and instill adequate safeguards to protect investors and maintain professionalism in the industry. Yes words are cheep and talk is easy. Ravinatha the only tie SL hd with Sri Lanka was that they started A Baur Company which pioneered the import fo fertiliser besides other things.